Water is supplied from an abundant source - river, lake, sea, or ocean - to a storage basin which, in turn, supplies the large pumps. These racks remove large debris such as seaweed, grass, or logs. These racks must be periodically cleaned to remove debris that builds up. These are large steel screens up to 30 feet long that rotate and filter out larger debris that passes through the trash racks. These large pumps supply water at over 100,000 gallons per minute to the condenser. The pump is usually over 15 feet deep. 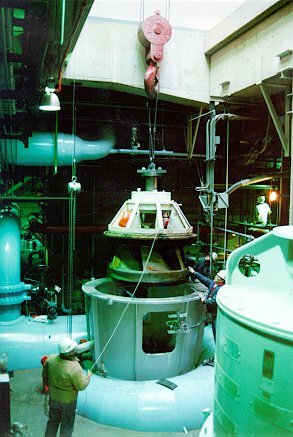 The motor assembly may be 8 to 10 feet high. A system which usually uses small abrasive balls pumped through the condenser tubes for cleaning. Usually these systems are very effective at cleaning the tubes. Several times per year the plant power level must be reduced so that the tubes can be manually cleaned. This operation is performed when plant efficiency decreases to the point where the plant's operations and engineering staffs determine the tube cleaning is needed to improve plant performance. The diagram below illustrates the arrangement of components within the system and the major flow paths. The green flow paths show how the water is taken from a river (yellow) to an intake supply basin (green) that the Circ Water Pumps take a suction from. The water is then pumped to the Condenser where the water is heated. The water is then sent to an exit distribution basin where the water then can be returned to the river and/or pumped by the Cooling Tower Pumps to the Cooling Towers then the water returned to the intake supply basin where the water can be reused. The Cooling Tower System is discussed elsewhere in site materials.